Women’s Win the Inner Game – Simple Solutions to Live Your Best Life NOW! Best vitamin/mineral supplement that you can get! When foods are eaten whole, you only get up to 35% of the nutrients (depending on the health of your digestive system.) When you drink fresh squeezed juice, you get up to 95% of the nutrients and they are available very quickly to your cells. Healing nutrients of raw fruits and vegetables are provided in their whole, complete and living form. Fruit juices are cleansers. Vegetable juices are nourishers. A means of providing high concentrations of healing nutrients in a form that requires very little digestion and assimilation of energy. Allows the digestive system to rest and rebuild. Juicing does away with indigestion, a lack of proper digestion. Juicing allows the body to both detoxify and heal. A one-month juice diet is the equivalent of 5-6 months on a raw fruit and vegetable diet. Juice must be freshly made using a high quality juicer such as a Champion. For cancer patients, a Norwalk juicer is recommended. Juice only organic produce. Otherwise you are getting a toxic cocktail! 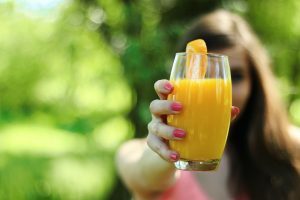 Sip juice slowly – consume between ½ gallon and 1 gallon daily. If the body loses its appetite, listen to it. It desires a rest and probably wants to do some cleansing. Drink only distilled water and very diluted (50%) juice. Do not continue for more than 2 days on this program. If something is desired to eat, eat melons. An occasional piece of raw, juicy fruit is acceptable, but no more than once a day. Do not drink after 8:30 PM. Drink purified water as desired. Exercise twice daily as it increases the efficiency of the diet, but don’t overdo it. Lighter exercise is preferred such as walking. Take one or two 15 to 30 minute catnaps daily. Get at least 9 hours sleep at night if possible. Your body is doing some major cleansing and healing and needs rest! It is essential to have at least one bowel movement daily to aid in the removal of toxins from the body. Take 1 Tablespoon of chia seeds in one of your juices to get the fiber needed. If you have not had a movement that day, then take a clear water enema before bedtime. Take a good quality probiotic 2 times daily. Take on an empty stomach. Use only freeze-dried type. Keep refrigerated. Decrease your consumption of food and eat your last meal by 6 PM. Eat only fresh fruit for breakfast. Your last meal the night before your fast should be all raw fruits & veggies. Eat only fruits for the first 2 days after completing the juice diet. The third day you may introduce raw veggies. Continue with only raw for another day. You may add cooked food on the 5th day after the juice diet, or sooner if you did a shorter fast. Breaking the juice diet properly is as important as the diet itself. If you break this type of regime improperly, you can undo some of the good that was accomplished. Interested in attending our juice fast retreat?Sign up now!